Deliciously addictive, this oat-free Double Almond Paleo Granola is easy to throw together with just five basic ingredients! You may never buy granola again! I poured a little medium size bowl of this wonderful Double Almond Paleo Granola to nibble on while writing this post. You know, for inspiration… Now I have a dilemma. Should I call it “granola” or “candy”? Around our house, if something’s REALLY good (even if it’s carrots or broccoli) we call it “candy”. Yes, this Double Almond Paleo Granola is definitely “candy”. And so very simple. Just five basic ingredients: almonds, coconut, sesame seeds, maple syrup and coconut oil. Okay, there’s also a pinch of salt and a splash of vanilla. That’s it. It’s a bit unusual as there are no oats, making it a little lower in carbs and higher in protein than most granola. I love that, because it keeps me satisfied longer than traditional granola. Although our family doesn’t follow a Paleo diet, this granola would definitely be quite legal for those who do. I like to throw the nuts and seeds together at night and also combine the wet ingredients in a separate bowl. In the morning, I just line a sheet pan with foil, spray it with cooking spray and stir together the wet and dry ingredients. I turn it out onto my sheet pan and pop the whole works in the oven. I usually head upstairs then, to have a quiet time before starting the day. Before I know it, there’s the most amazing aroma wafting through the entire house. It’s a tricky (some people might call it sneaky) way to get Scott out of bed – I don’t have to utter a word! I call it Double Almond Paleo Granola because I use two types of almonds, sliced and slivered. The combination looks pretty and gives lots of nice texture and crunch. We enjoy this combination so much in my traditional granola, I decided to use it here as well. Nuts are expensive so I like to stock up at Costco on their sliced almonds as they’re more reasonably priced in bulk. It’s a large quantity but I just keep it in the freezer and the nuts stay fresh. I usually pick up the slivered almonds at Trader Joes and I use their coconut in the granola as well. 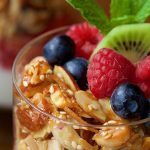 This Double Almond Paleo Granola is delightful on it’s own, as a snack, with yogurt and fruit, sprinkled on ice cream, even as a crunchy salad topping! Maybe you could do me a favor and make a batch. Let me know if you think it should be called “granola” or “candy”. I have a feeling, it will be your turn to have a dilemma! This Double Almond Paleo Granola freezes well! P.S. This granola freezes well. I store it in glass jars with wide mouth tops. I keep one in the pantry and the rest in the freezer. It also makes great little gifts! Deliciously addictive, this oat-free Double Almond Paleo Granola is easy to throw together with just 5 basic ingredients! You'll never buy granola again. 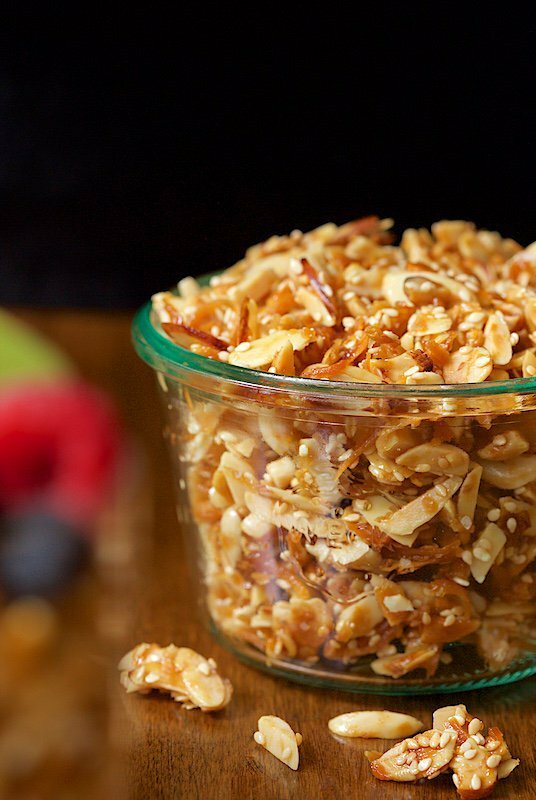 Combine almonds, coconut and sesame seeds in a large bowl. Over low heat, combine maple syrup and coconut oil until heated through. (You can also heat the maple syrup and coconut oil in the microwave on high heat for 1 minute or until coconut oil is melted.) Remove from heat and stir in vanilla and salt. Bake for 30 minutes then stir well with a spatula to redistribute. Return to oven and bake another 15-25 minutes or until golden brown. Watch carefully the last 15-20 minutes as ovens vary. You want it golden but not too deep brown. Remove from oven and allow to cool completely on pan then transfer to airtight storage containers (I use wide-mouth glass jars.) Can be stored at room temperature for up to a week and in the freezer for several months. * I love the slightly sweetened coconut from Trader Joes. You could also used unsweetened coconut. This granola is addictive!! I am in grad school and I made this for my class. It is now referred to as “crack.” My profession gave up refined sugar for lent and I gave him this granola and he just flipped! Also great for those on paleo. It is great on salads, in yogurt or just to munch on to satisfy a sweet tooth! I have also baked it into muffins and cookies!! Great recipe!! Thank you!!! I don’t know when to add the oats, it doesn’t say in the recipe or did I miss it? 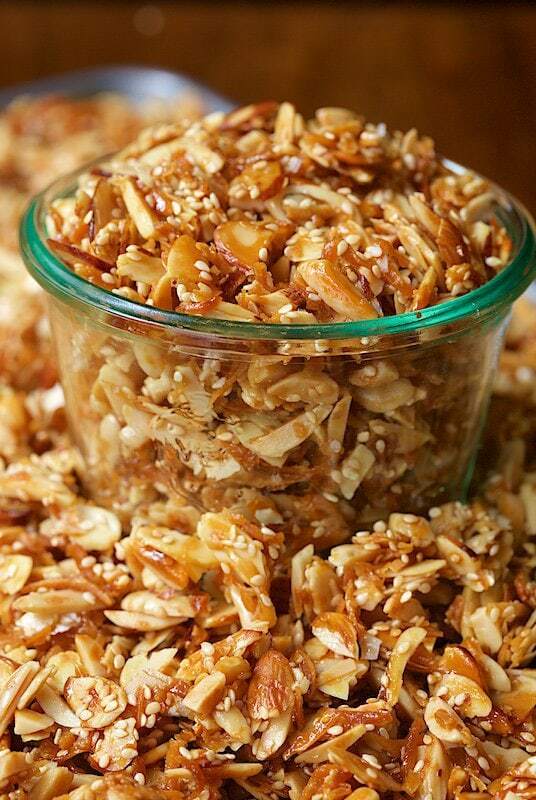 This granola is absolutely delicious as are all your recipes that I’ve tried! Made this for my Mom and of course she emailed me for the recipe! Thank you Chris for your amazing recipes and the beautiful pictures that just make my taste buds pop! Yep, it tasted like candy but better! I’m making it for sure! Then I’ll take my fitbit for a long walk! I am just letting out a big sigh as I look at these gorgeous pictures because I so wish this was on my desk right now! I will make this because I’m a big granola fan and you’ve assembled all my favorite ingredients. Thanks, Chris! Hi Chris, yes for sure Candy, love, love this! 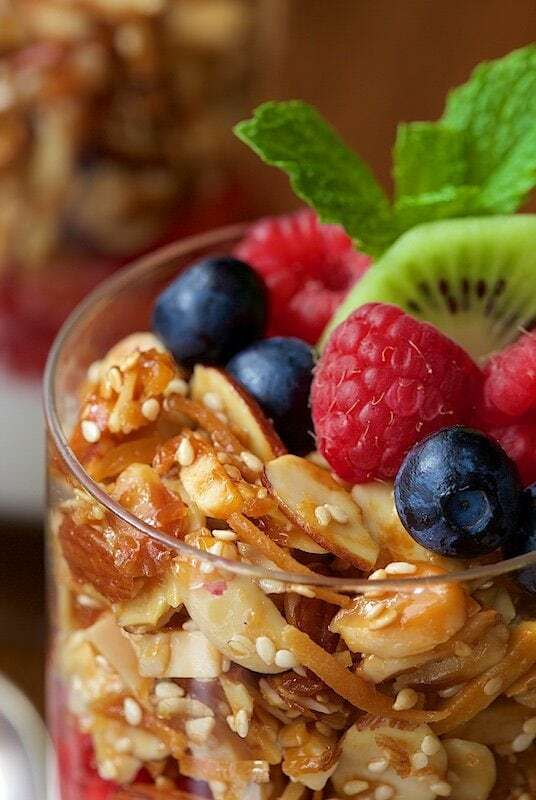 Such a clever idea to not add the oats, love your presentation! This would definitely be candy but I’d call it granola to make myself feel better about the seconds and thirds I would have. Definitely candy. This looks terrific! We always freeze our nuts, too. Otherwise they can go rancid (doesn’t often happen, but it can). Bummer to have to toss any food, but particularly one that can be so expensive. Anyway, love this — perfect snack. Or breakfast. Thanks! 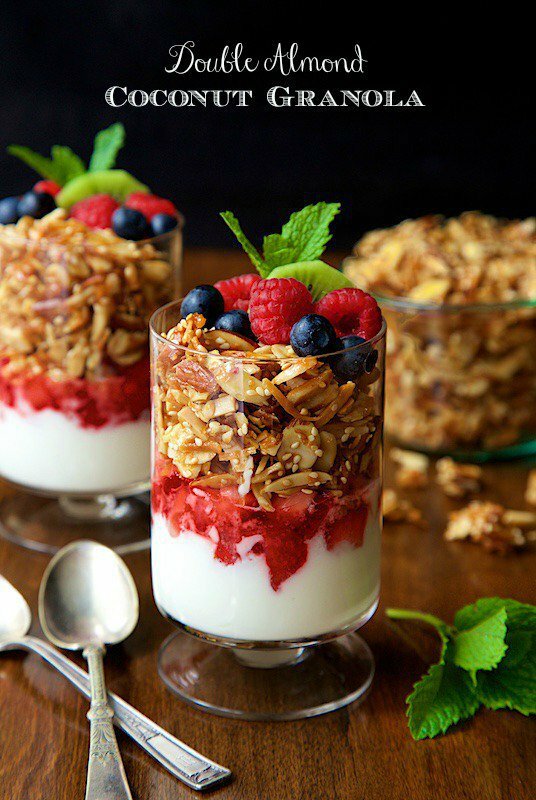 wow…this is first class homemade granola! I am afraid that I wouldn’t stop eating until it’s all gone! This almost looks like brittle – and I bet it is fantastic – in or on everything. Wonderful recipe Chris! I love granola. Whether I’m eating it by the handful or on top of some yogurt, I can’t get enough of it! I really love how simple this recipe is and how tasty all the ingredients are. I’m definitely going to give this a try ASAP! Can I ask where you got the footed glasses? Love them! This is calling my name Chris! Definitely candy! 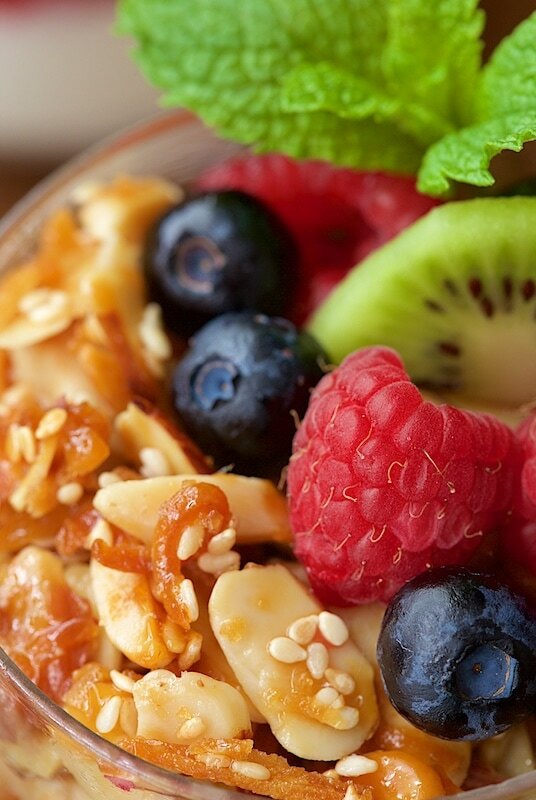 The parfait you made with it is beautiful! And it must smell divine! You think of everything. When I was a young mother, I made granola and did macrame. I guess I fancied myself a hippie. But I know with certainty mine was not as good as yours!